Today we visited a handful of holy sites, the first of which was Jacob’s well, which is housed in a Greek Orthodox monastery and church. The eldest priest there is a gifted iconographer who has spent the past 3 or 4 decades creating magnificent icons that are placed throughout the space of the church. The sale of original copies helps to sustain the church and gives pilgrims something special to carry home. 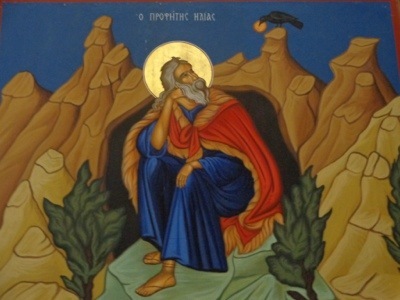 The icon pictured here is of Elijah being fed in the desert by a raven. The message is clear: God will take care of our needs although often the particulars — the substance and the delivery system — are not what we would choose for ourselves. 12-step wisdom reminds us that “we get what we need, not necessarily what we want.” Sometimes it takes us a while to recognize how blessed we are by what we are given, especially when it does not match our expectations. Elijah is dumbfounded when God calls him to service. He is not fit for such work as far as he can tell. And if he is obedient, he will surely face death. But the Holy Spirit fills in the gaps. The Holy One has compensated for human deficiency. The woman at the well, the Samaritan woman, is startled to be addressed by this man Jesus (John 4). She is startled to be acknowledged, much less to be seen for who she is. She comes to the well understanding her role as a woman — to fetch the water — and yet she is able to let go of her assumptions as Jesus speaks with her. She is able to receive Living Water that will never run dry. This entry was posted in 12-step spirituality, Christianity, faith, peace and tagged Christianity, Isaiah, living water, Nablus, ravens, Samaritan woman. Bookmark the permalink.